Joe Hart admits: “I feel like I’ve been set free” after his move to Burnley. 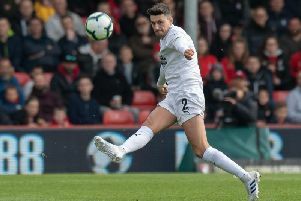 The 75-cap England international joined the Clarets on Tuesday from Manchester City, in a £4m deal, and was thrown in at the deep end on Thursday night as he made his debut in the Europa League at Istanbul Başakşehir in the Europa League. Hart kept a clean sheet, making a couple of good first half saves, and, after two years spent on loan at Torino and West Ham, he is happy to have a permanent home again. His arrival means Burnley have three of the last five keepers capped by England on their books, with Tom Heaton and Nick Pope currently out injured, and Hart said: “Nick’s was a bad injury and Tom had a difficult year last season. I was available, so we sat down about where my head was at. “I made it clear it was very interesting but I didn’t want to go on loan again. It was the last year of my contract and I needed to cut ties with them and be free. “I feel like I’ve been set free here and I’m excited. “I was a loanee player at 31. I’ve got vast experience and won things, but at the end of the day I was a loanee, which is what you expect from someone 18-21. “It was difficult for people to necessarily warm to what I was doing. Except from inside the dressing room nobody knew what I was about. “I’ve always made it my business that wherever I’ve been, then that’s where my heart and soul is. And his first impressions of one of the more welcoming dressing rooms is a good one: “I loved it. I’ve only been here a couple of days and the lads have been absolutely fantastic with me. “The club kind of sold itself really, given the atmosphere and how they go about things. “It’s me down to a tee. “It’s the first club I’ve been at since Shrewsbury Town that the majority are English. It’s a very British team. And even the foreign lads are British-foreign. It’s nice, really interesting to be a part of. “Obviously I’ve only just come into it so I need to find my place but they are really welcoming. “Regardless of nationality, everyone is on the same page at this football club. Hart has won the Premier League, FA Cup and League Cup, and played at the World Cup and in the Champions League. But this is a special time in Burnley’s history, and he is aware of the club’s growing reputation: “It’s really well-respected and deservedly so. “We need to keep building on that if we want to move forward. “It’s not trying to take giant steps but ease forward. Hart knows Heaton and Pope well from England duty, and knows he faces fierce competition when they are fit and available: “I love being around top keepers. I love being around managers who want to pick the best team available. “I back myself regardless who is where at what club. I back myself to be in a good position, I’m going to train as hard as I can. “I spoke to the other two: whoever plays, we’re going to support each other like we have done when we’ve been together in the national team. Hopefully that will continue. “I’m excited to be around it and I want to bring something to the party. Hart went from first choice for England in World Cup qualifying, to not making the squad for Russia, and he mused on that loss of respect for his ability: “I don’t know. It’s whatever, isn’t it? You’re struggling and fighting a losing battle. “I’m going to continue being me through the good times and the bad. I’m going to keep loving football. “That’s one thing I’m most proud of: my hunger and desire for the game has not stopped. That’s not easy, you know? Nothing has changed yet. And his new manager has shown he has faith in him: “He showed great depth of knowledge of my career. He was still playing at Northampton when I was at Shrewsbury. “The fact is I’ve lost some respect but other people know what I’m capable of and what I bring to a team. Sean is a footballing man and I’m really pleased he saw that in me. “It’s been quite politically difficult to believe in me in recent times. I’m a big head to chop off if you want to shake things up.